A Sephora inside JCPenny exclusive, The Paparazzi ($42) is one of many gift sets by Nails inc., featuring 15 best shades from the brand in an assortment of different finishes and miniature sizes. The Paparazzi features everything from darker hues to neons to neutrals and glitters! The set also features three new shades - Docklands (Neon Red), Bruton Mews (Dark Smokey Green Creme) and Richmond Terrace (Dark Chocolate Brown). I've had pretty good luck with Nails inc. polishes before and they last a good 3 days on me before chipping. As for the bottles in this set, they are a tiny size, but I've never finished any nail polish completely, so I'm not complaining! They also have a short, narrow brush for smaller nails like mine. *All swatches with only base coat, no topcoat. 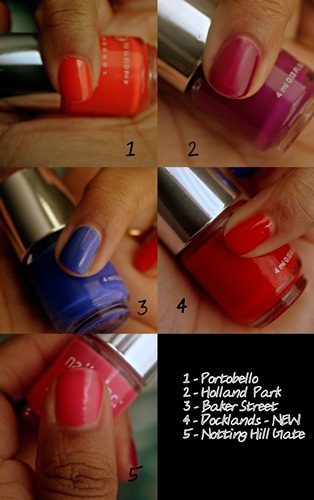 The neons are like any other neons and lack the shine that regular cremes have, so be sure to use a topcoat. They are quite opaque and easy to work with. Baker Street, one of their best selling shades is my favorite of the bunch! The nudes and darker colors are the best part of the set. They are just amazing, formula and color wise. All shades are very easy to work with and very flattering against most skin tones. The glitters, as pretty as they look, are a real pain to remove. I would recommend using them on top of a creme polish to ease removal. The one red polish (The Boltons) however, has a metallic finish with no glitter and is a gorgeous shade for the holidays! If you love glitter nail polish though, this set has some beautiful colors to play around with. Overall, a really nice way to try out a bunch of awesome colors from Nails inc., just so you can decide which ones you may want to buy full sizes of. I would definitely pick up Baker Street and a few nudes in full sizes once I'm almost done with these tiny bottles! What are your favourite nail polishes from Nails inc.? such a great color collection! loved it!